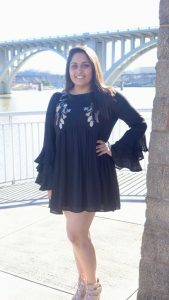 Though Dhara will be continueing her time at UTK her time in the IVC lab will be coming to an end in May. Dhara has been a member of the lab for a year now. Before she leaves we wanted to know what her plans for the future are and how her time in the lab has impacted her. Dhara:In the upcoming year, fall 2018 I will be a senior. My time with the Infant Visual Cognition Lab has been a knowledgeable experience and I feel like I have grown a lot since I started being a research assistant. I have learned many new things from eye-tracking to how infants behave in the such ways. Everyone in this lab has been very nice and helpful and I hope to continue using that knowledge further in the future. Thank you for your time Dhara and we know your senior year at UT and all future endevors will be successful!